NASA has picked new American astronauts to visit the International Space Station in 2018. Two American astronauts, one a spaceflight veteran and the other a rookie, will launch to the International Space Station in 2018, NASA announced today (Jan. 4). Veteran NASA astronaut Andrew Feustel and first-time flyer Jeanette Epps will each visit the space station next year as part of the Expedition 55-56 and Expedition 56-57 crews, NASA officials announced in a statement. Feustel will launch to station in March of 2018 as an Expedition 55 flight engineer, then take command of the station's Expedition 56 crew a few months later. Epps, meanwhile, will launch to the station in May 2018 as an Expedition 56 flight engineer and then stay on during the Expedition 57 mission. Feustel is from Lake Orion, Michigan and a veteran of two NASA space shuttle missions. He joined NASA's astronaut corps in 2000 and flew aboard Atlantis on STS-125, the last mission to the Hubble Space Telescope, in 2009. Feustel returned to space in 2011 on STS-134, the final flight of the shuttle Endeavour. which visited the International Space Station. He has degrees in Earth sciences and geophysics (from Purdue University) and a doctorate in geological sciences from Queen's University in Kingston, Ontario in Canada. Epps is from Syracuse, New York and will make spaceflight history during her Expedition 56-57 mission when she becomes the first African-American crewmember of an International Space Station expedition. She will join Feustel during the Expedition 56 phase of her flight. Epps joined NASA's astronaut ranks in 2009 after serving seven years as a technical intelligence officer with the Central Intelligence Agency. Before joining the CIA, Epps earned a bachelor's degree in physics from LeMoyne College in Syracuse, followed by a master's of science (in 1994) and doctorate (in 2000) in aerospace engineering. "Each space station crew brings something different to the table, and Drew and Jeanette both have a lot to offer," NASA Chief Astronaut Chris Cassidy at the agency's Johnson Space Center in Houston said in a statement. "The space station will benefit from having them on board." 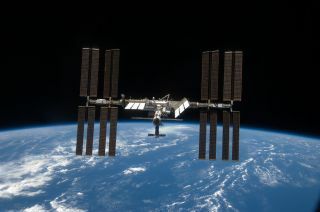 The International Space Station is currently home to a crew of six; three Russian cosmonauts with Roscosmos, two Americans representing NASA and one French astronaut from the European Space Agency. The crew makes up Expedition 50, the 50th mission to the space station since the first crew — Expedition 1 — took up residence in November 2000.